This bag is an amalgamation of the front of the 2001 bag and the back of the 1996 bag. 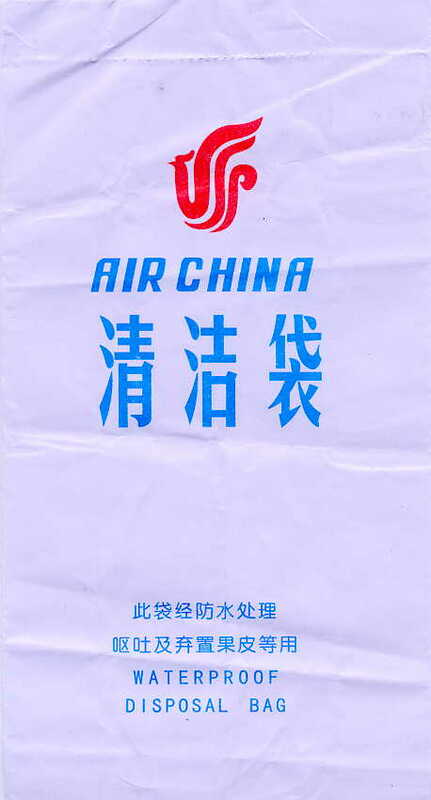 This is identical to the earlier Air China with a red seal except the middle Chinese character has changed! 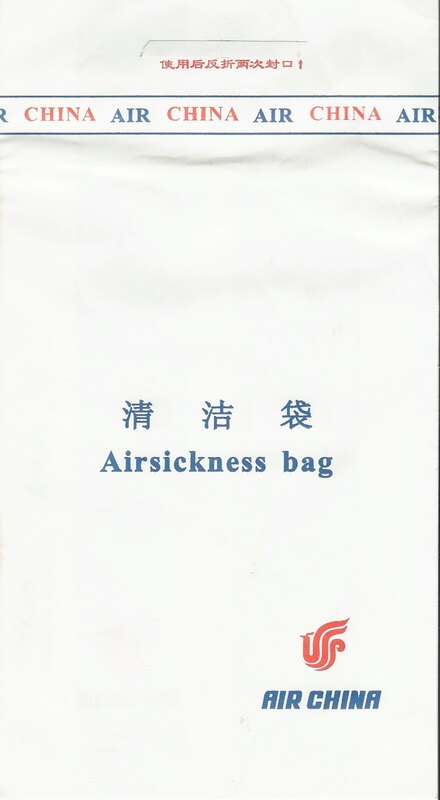 What could this new bag say? Is it political correctness? Once again, a museum visitor to the rescue. 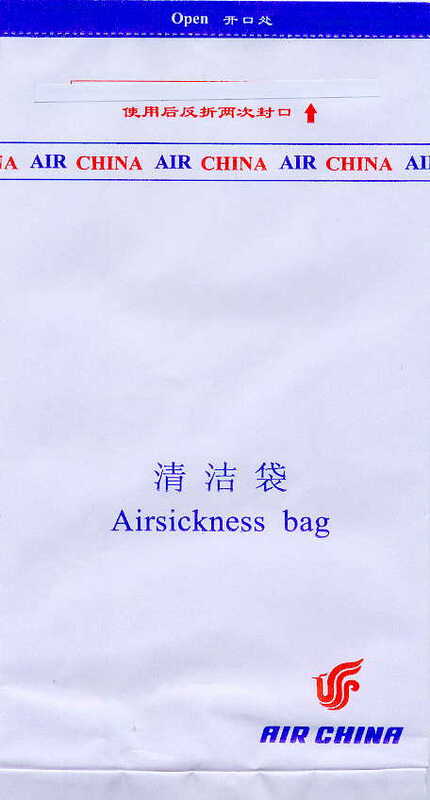 Bag scholar Robin Gomi says, "The middle character is a "simplified" version of the older complicated Chinese character. 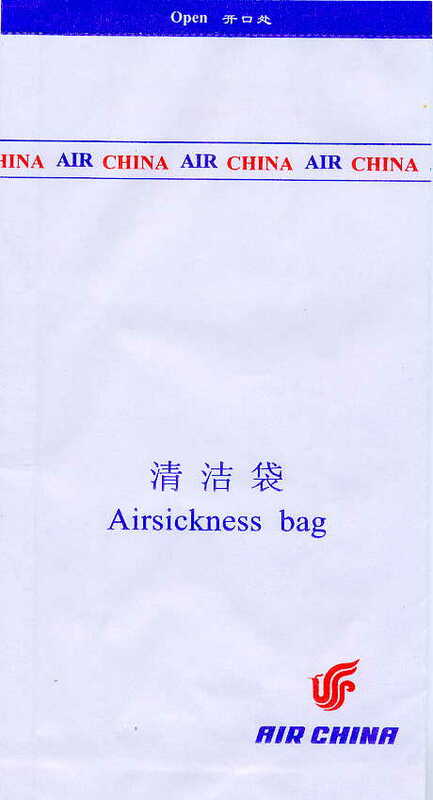 The three Chinese characters on the bottom combine to mean "clean and pure bag". Thanks for clearing that up, Robin! 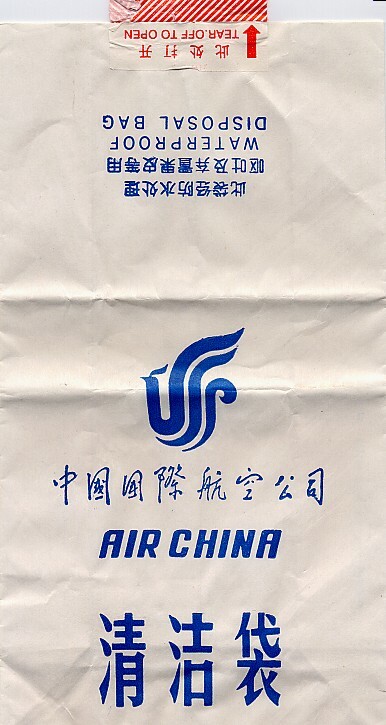 A sleeker, sexier Air China than proffered in the past. 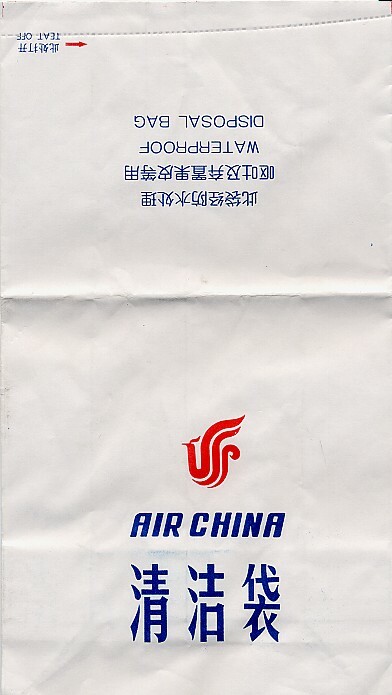 Exactly the same as other 2002 Air China, except somebody's graphic design layout program went haywire. A monstrosity appears on the bag because the scale of the arrow is much too large. 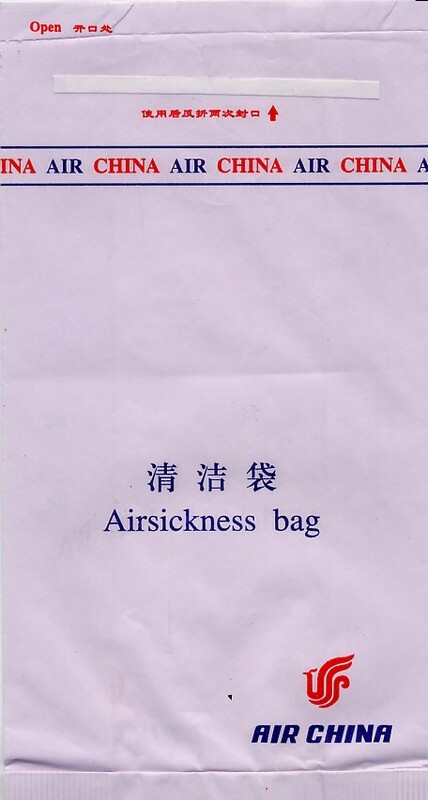 Another year, another bag for Air China. This design is sleeker and sexier than previous versions. 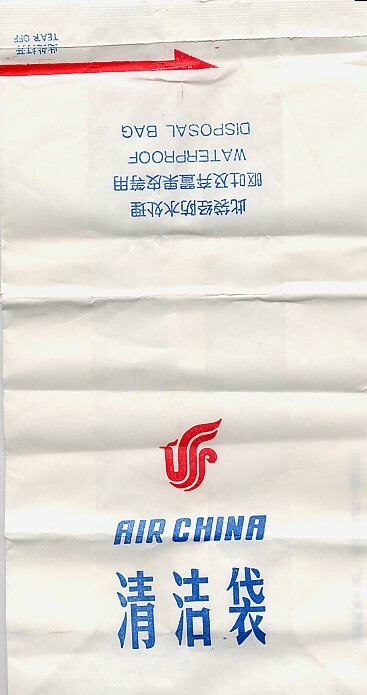 Pretty much the same as the other 2003 Air China bag, except this bag is much smaller and has a PINK background. Very soothing, I understand. 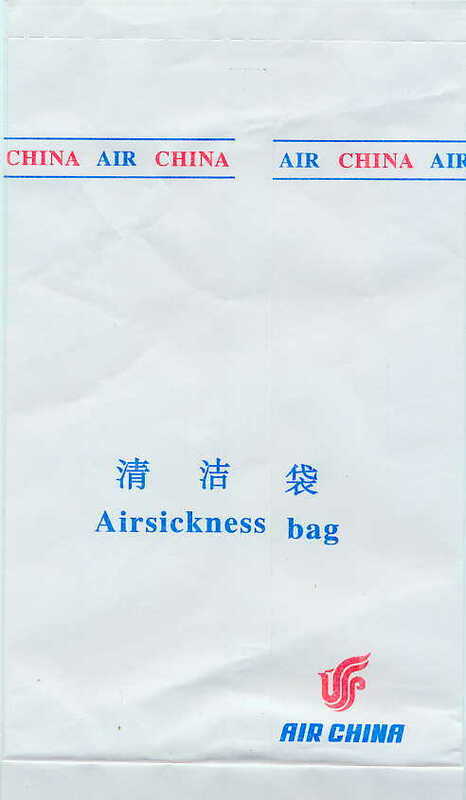 Air China rearranges their bag again, for no particular reason it seems to me. 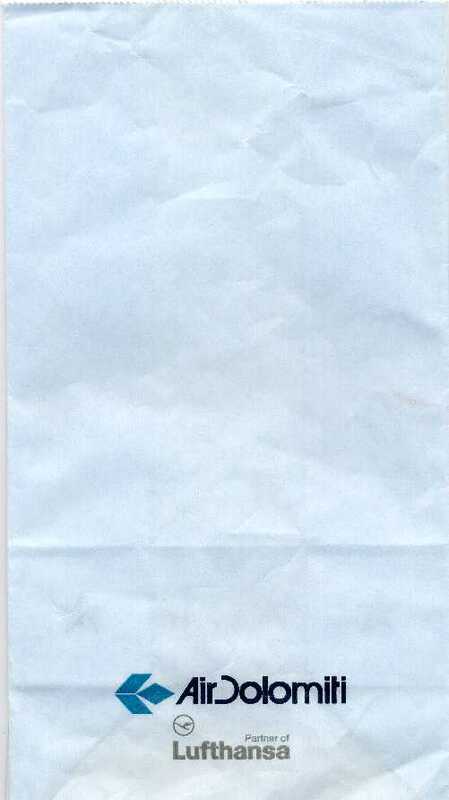 This bag is almost identical to the 2003 bag except the ticker on the front is offset a bit and the rectangle on the adhesive strip on the back is red. This design is identical to the 2003 design, except they left off the "open" directive on the front of the bag. This design is identical to the 2003 design, except for the new purple tear strip. 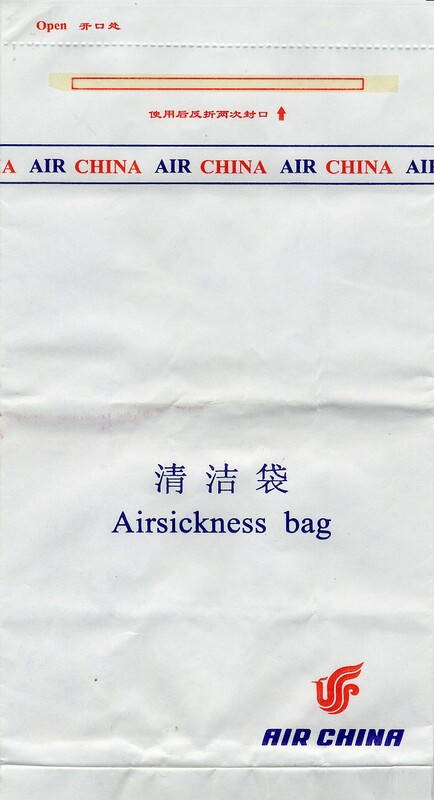 This bag is identical to the other 2007 bag except in the gusset of this bag you find Chinese Characters, not the English letter "A". Same as the 2007 version except the "Open" instruction now has an arrow next to it. Plus, there is a blue dashed line at the top where the scoring is. 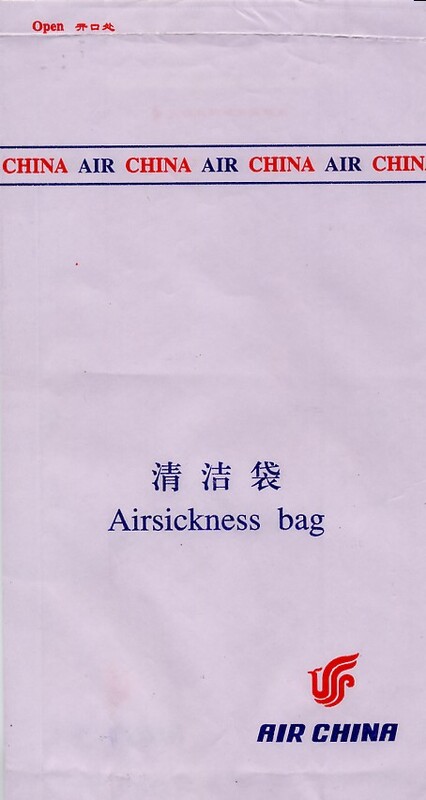 Thanks for the improvements, Air China! 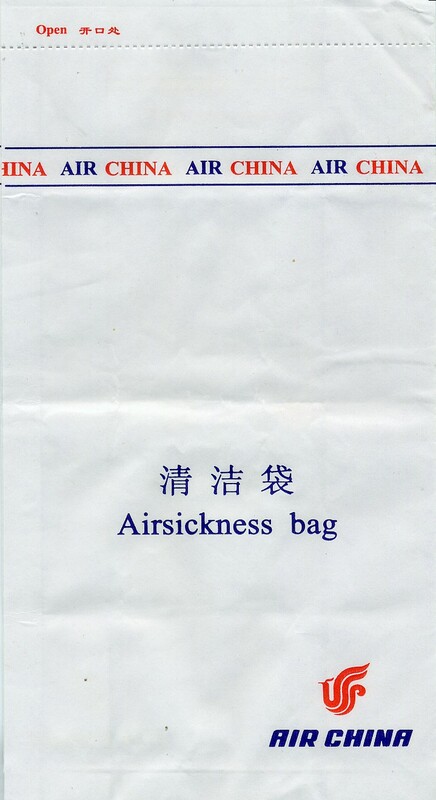 This is an incredibly cheesy bag that the designers just gave up on. You can hardly even read the company name because the reverse-text is so ill advised. 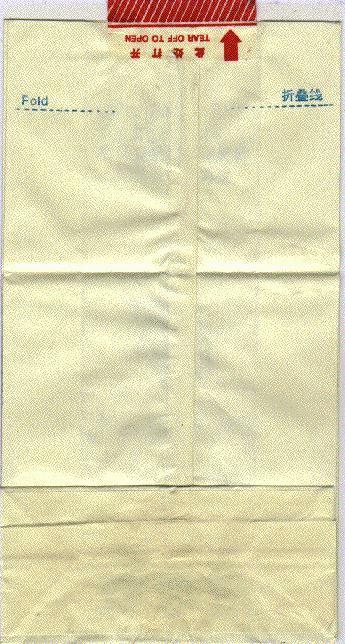 Bag sports a huge rectangle with, get this, NOTHING in it. Why have the rectangle at all? 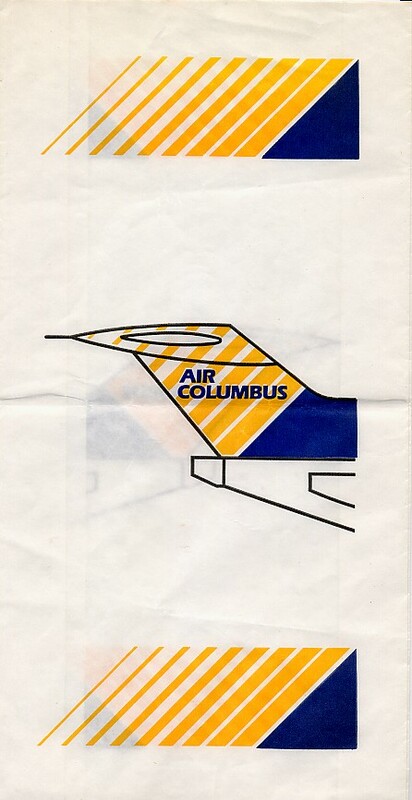 Someone at the (now defunct) Air Columbus might be able to tell you. You might be tempted to guess that this carrier serves Columbus, Georgia, but it's actually a defunct Portugeuse airline. 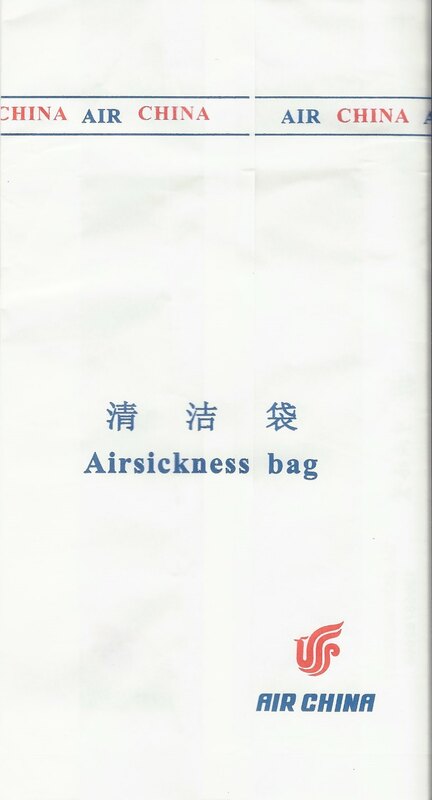 Eerily similar to the Sky Air bag. OK, maybe it's not, but it does feature the same colors. 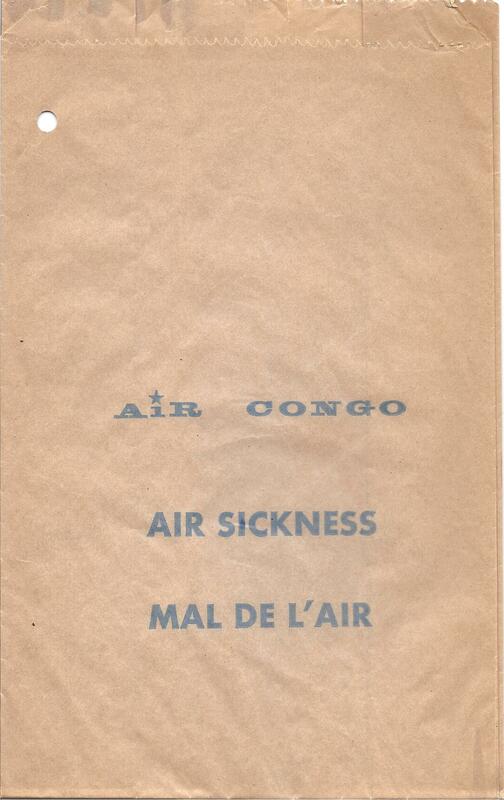 The Congo changed its name to Zaire in 1971, so just for the hell of it, I am classifying this as a 1971 version even though it could be earlier. I'm guessing that few people could correct me, but I hope someone does! Seriously though ... Congo! 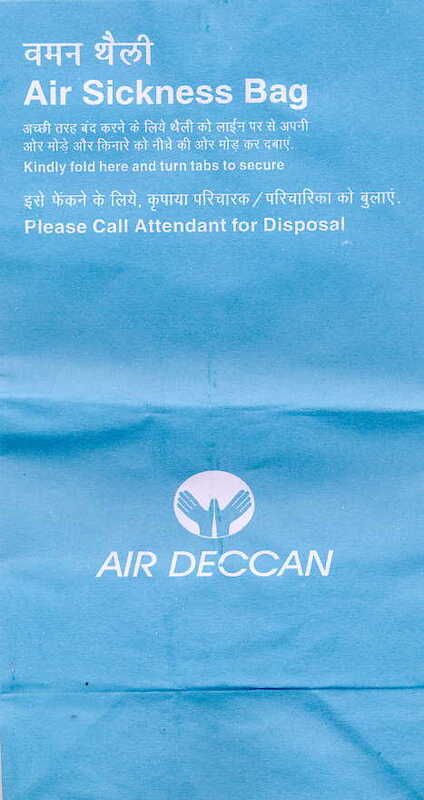 Unremarkable bag from Air Corsica. 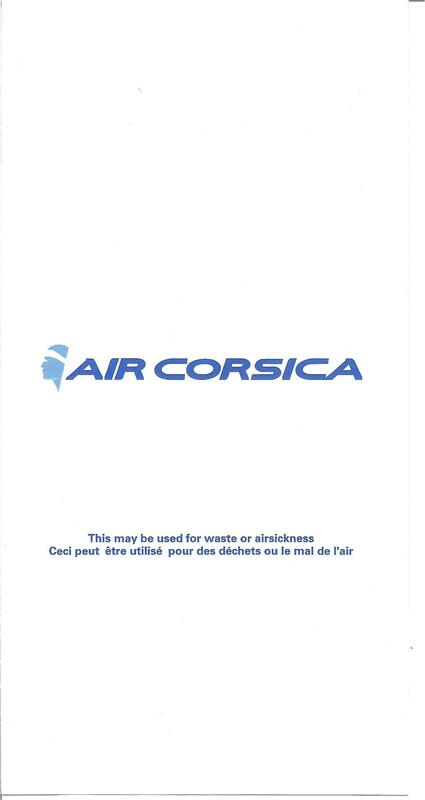 Features the Sweatband Head from former CCM, Air Corsica's predecessor. The logo on this bag looks like someone stuck their hands in front of a film projector hoping to make the shadow look like a bird. I think they should call this airline Hairdo for no particular reason. The pictograph seems to prohibit lamps. This one is really cool because of its refreshing mint background color. Pretty nice for its simplicity.